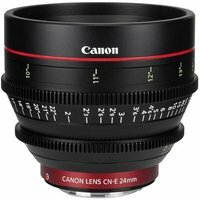 The Canon CN-E24mm T1.5 L F Cine Lens is a wide-angle lens that offers a broader perspective to capture spectacular landscapes or small interiors. The 24mm T1.5 L F Cine Lens with EF mount is lightweight (1.2kg) and features a constant f/1.5 maximum aperture to enable hand-held shooting in low light. The well-rounded 11-blade diaphragm provides a smooth, attractive blur for elements in the image that are out of focus. This lens has been designed for use with Canon's C-series cinema cameras (EOS C100, C300 & C500) and Canon's range of full-frame DSLRs with an EF-mount (such as the Canon 5D Mark III, 1D X and 1D C).